The birthday posts continue! Don’t fret…I am almost finished with them ;) Today I wanted to quickly touch on the party favors, treat bags, whatever you choose to call them. I’m just going to show some pictures of what I did with some very brief explanations so that maybe it will inspire you in your MLP treat endeavors! 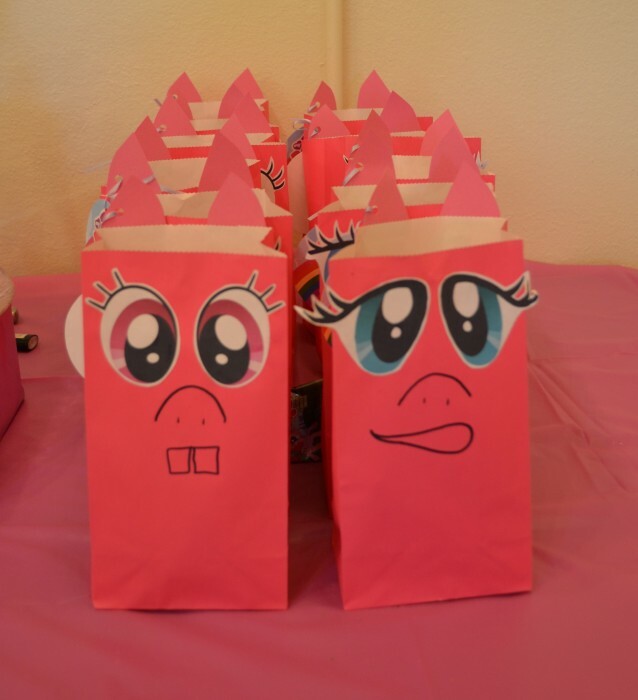 Here we have some My Little Pony character treat bags. Now, the creative goddess in me wanted to buy all the colors of the main pony characters and do up the bags just like them with their specific eyes, cutie marks, etc. But in reality I didn’t have the money or time to do that…so I stuck with the main party theme colors and I got solid pink bags. I then cut out and glued ears on to them, printed out MLP eyes and glues them on and then my husband and I made silly little faces on them all. 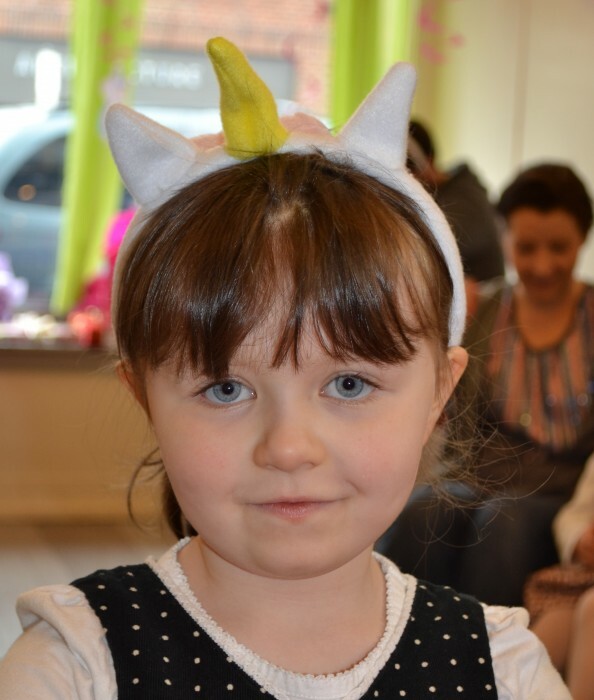 I personally think they look like piglets lol …but all the kids knew they were ponies so it worked out well! 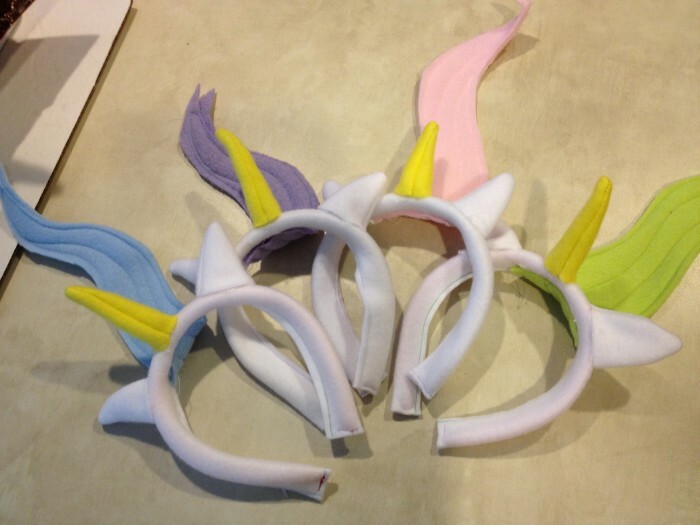 Instead of traditional party hats, I decided to make unicorn headbands using scraps that I had lying around. I purchased some cheap plastic headbands at target, covered them in a fleece “tube” that I sewed and then hot glued on a mane, horn and ears. I figured the kids would have more fun with them and they could use them over and over again after the party. I made several colors so that boys and girls would both feel okay weraing them…. Next comes all the goodies that go in to the treat bags! I’ll start off with the MLP necklaces! I went to the Dollar Tree and bought some cheap necklaces that came in 3 packs. 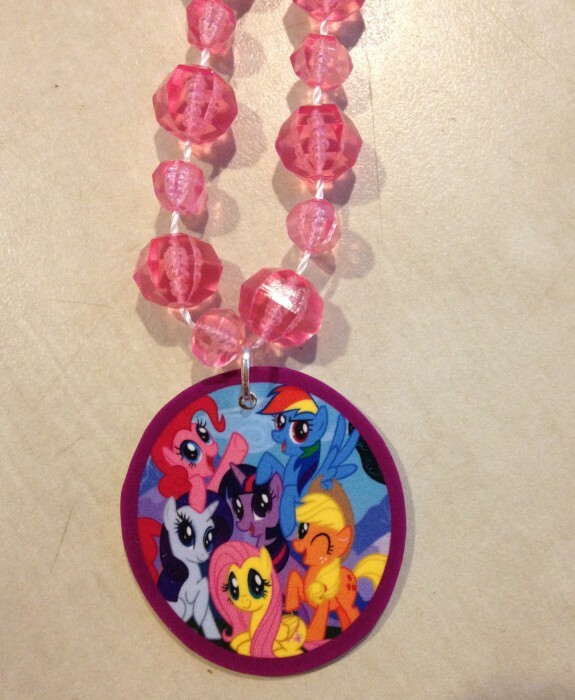 I then used inkjet printable shrinky dink paper to print of MLP images, punched a hole in them, shrunk them down and then attached them to the necklaces to create MLP jewelry! The rest of the treat bag….. I found books of unicorn stickers at Michaels craft store for only $1 each! I cut out pages so each kid got tons of stickers. I also bought some plastic bracelets from the dollar tree as well as those awesome plastic bubbles you can blow out the little straws. They make MLP fruit snacks so, of course I had to include a pack of those in each bag. 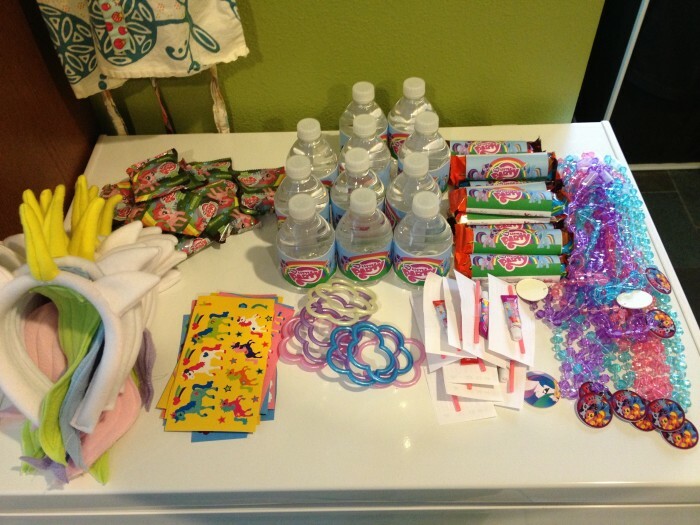 I also wanted to utilize the printables I ordered from Etsy so I bought water bottles and candy bars on sale at safeway and used the candy and water bottle wrappers to make them match the theme! They turned out to be nice, full bags without a ton of candy. I didn’t want to tick off the other parents lol….. 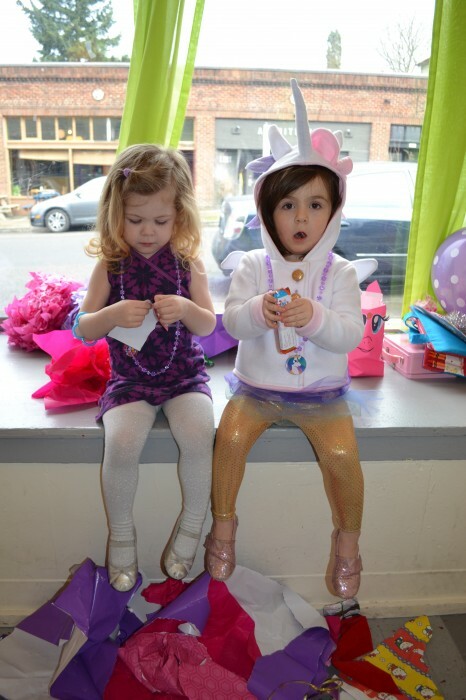 Here is Penelope and her friend Evie at the end of the party, enjoying their treat bags =) In all, I’d say it was a success!